The Newport Mercury announced a "Grand Instrumental Concert" to be given by the full Germania Musical Society ensemble on July 16, 1849 at the grand hall of the Atlantic House. Tickets were fifty cents. Doors opened at 7:30pm. The concert began at 8:30pm. In his newspaper abstracts, Newport Historian Lloyd Robson described this Newport Mercury article as the first public notice of the German musicians on the island. As with the other major hotels in Newport, the Germania soon became central to the Atlantic House experience. The Atlantic House opened in 1845 on Bellevue Avenue and Pelham Street and was instrumental to Newport's economic boom during the period. The Atlantic featured Greek Revival design elements, including a glistening white veranda that wrapped around three of its sides. The hotel stood four stories high and could accommodate 250 summer guests. The Atlantic House was known for its topnotch amusements and featured dances and balls on a regular basis. Harper's New Monthly Magazine, the authority on American culture and society at the time, published a piece in 1854 outlining the historical context for the burgeoning tourist-based economy in Newport. Harper's stated, "From about the year 1840, and the erection of the 'Ocean House' and the 'Atlantic House,' may be dated the renaissance of Newport. There is an immortal excellence in the air and the island which will not suffer it to fall into forgetfulness or complete decay." The Germania were known for innovative musical programming in Newport during this "renaissance" and gave a "Soiree Dansante, Preceded by a Grand Instrumental Concert" at the Atlantic House in 1853. An ad in the Newport Daily News previewed the program which included a classical concert, considered "part 1," and a set of dance tunes, "part 2," mostly composed by Strauss and the Germania's own Bergmann. In that same issue, it was suggested in commentary that it would probably be, "the only entertainment of the kind," that summer, and "lovers of excellent music and those who are fond of dancing, should not fail to attend." The full band also performed for this particular engagement, whereas at many of the other hotel "hops" (or, dances) only a portion of the Germania played, as they would be divided throughout Newport performing in smaller ensembles at the major hotels. A few years later, on July 21, 1855 the Newport Mercury declared for the record: "The arrival of the Germanians this week, proclaims the commencement of the season, and the genial face of the leader, as he reappeared on the piazza of the Atlantic (House), was a harbinger of musical delight to young and old." The Germania were a core facet to the Atlantic House and Newport's summer identity. Tinted Lithograph of the Atlantic House and Old Stone Mill: Built across from the fabled Old Stone Mill in 1845, the Atlantic House capitalized on an increasing demand for expansive and entertaining hotel establishments during Newport's hotel boom. The Atlantic House rivaled Newport's other premier hotels, featuring pristine landscaping in a classic setting. "Atlantic House Polka-Redowa" Sheet Music Page: The "Atlantic House Polka-Redowa" was composed by Germania conductor Carl Bergmann and published in 1856 by William Hall and Son (New York). 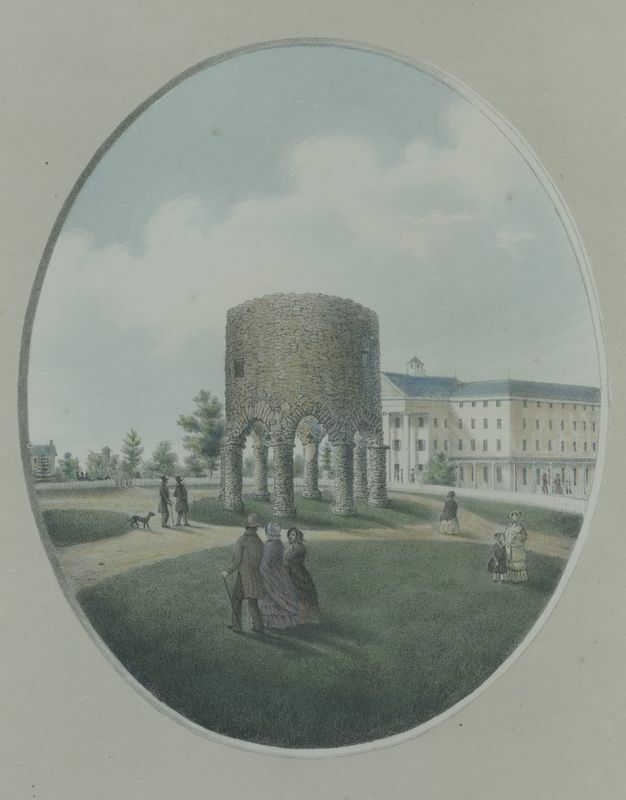 It was part of a series of 4 works entitled The Season in Newport, which included tributes to all the major hotels. 141 Pelham St., Newport, RI 02840 ~ The original Atlantic House is demolished. 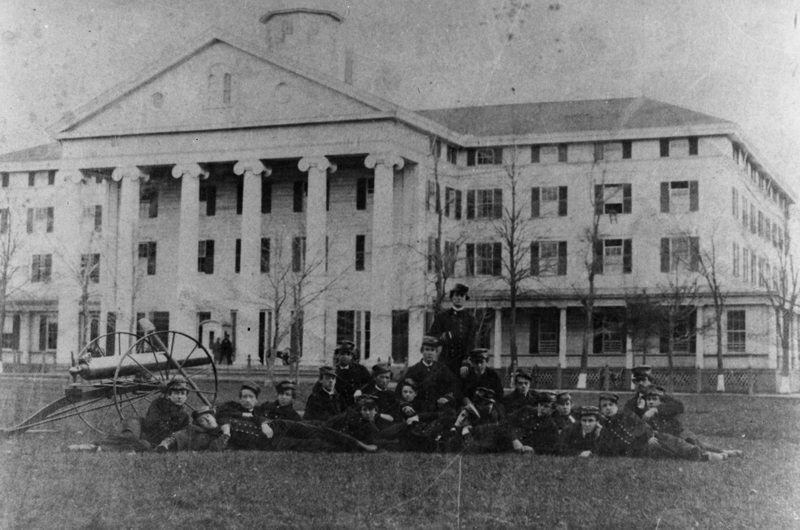 From September of 1861 until the end of the Civil War, the Atlantic House became the temporary home of the United States Naval Academy. The Atlantic House attempted to reestablish itself after the war by adding new amenities, but ultimately had to close its doors. It was demolished by 1877. Today, the Elks Club of Newport stands in its place. One of Carl Bergmann's compositions, "Love Polka," was written to be a souvenir for the Germania's admirers in Newport. Since performers of the Germania returned to Newport for two more years after being officially disbanded, it's safe to say that the feelings were mutual. You can find the sheet music (arranged for piano) for this piece (and more) within the Newport Historical Society's collection of music. Brian Knoth, PhD, “The Atlantic House Hotel,” Rhode Tour, accessed April 21, 2019, http://rhodetour.org/items/show/335.